Man, as we know him, is a poor creature; but he is halfway between an ape and a god, and he is traveling in the right direction. Democracy is a form of government which may be rationally defended, not as being as good, but as being less bad than any other. Admiration for ourselves and our institutions is too often measured by our contempt and dislike for foreigners. Beneath the dingy uniformity of international fashions in dress, man remains what he has always been — a splendid fighting animal, a self-sacrificing hero, and a bloodthirsty savage. Human nature is at once sublime and horrible, holy and satanic. Apart from the accumulation of knowledge and experience, which are external and precarious acquisitions, there is no proof that we have changed much since the first stone age. Democracy is a form of government which may be rationally defended, not as being good, but as being less bad than any other. History gives no countenance to the theory that popular governments are either more moral or more pacific than strong monarchies. If an autocracy does not rest on the army, which leads to the chaos of praetorianism, it must rely on ‘panem et circenses.’ Hence it has some of the worst faults of democracy, without its advantages. The excesses of revolutionists are not an argument against democracy, since revolutions are anything rather than democratic. The democracy is a ready victim to shibboleths and catchwords, as all demagogues know too well. No one can govern who cannot afford to be unpopular, and no democratic official can afford to be unpopular. Sometimes he has to wink at flagrant injustice and oppression; at other times a fanatical agitation compels him to pass laws which forbid the citizen to indulge perfectly harmless tastes, or tax him to contribute to the pleasures of the majority. 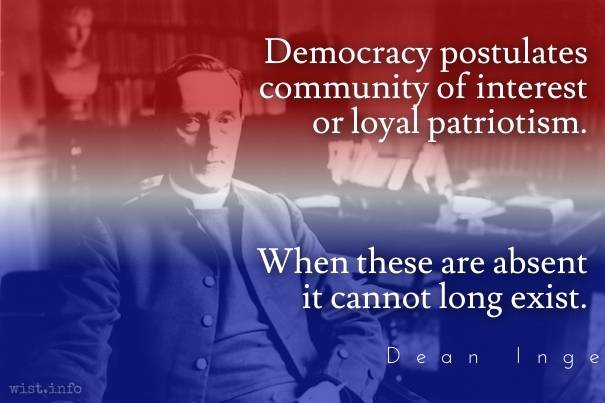 Democracy postulates community of interest or loyal patriotism. When these are absent it cannot long exist. Senseless extravagance is the best friend of revolution. But it must be remembered that, in spite of the proverb, it takes in reality only one to make a quarrel. It is useless for the sheep to pass resolutions in favour of vegetarianism, while the wolf remains of a different opinion. Sometimes quoted as "while wolves remain of a different opinion." 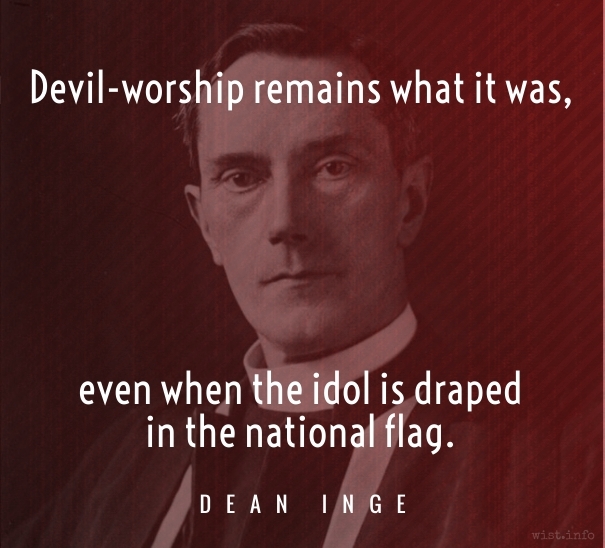 Devil-worship remains what it was, even when the idol is draped in the national flag. But, though pugnacity and acquisitiveness have been the real foundation of much miscalled patriotism, better motives are generally mingled with these primitive instincts. 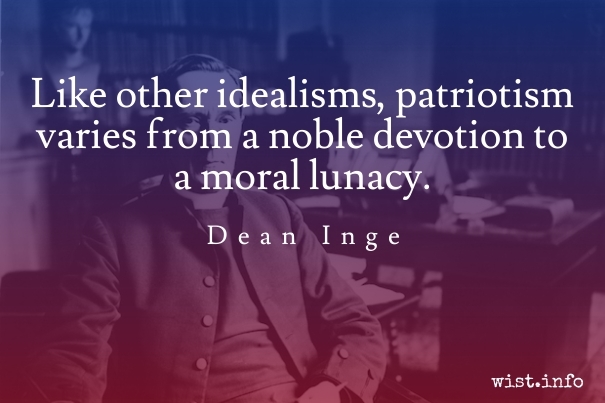 It is the subtle blend of noble and ignoble sentiment which makes patriotism such a difficult problem for the moralist. The patriot nearly always believes, or thinks he believes, that he desires the greatness of his country because his country stands for something intrinsically great and valuable. The history of the Jews also shows that oppression and persecution are far more efficacious in binding a nation together than community of interest and national prosperity. Increase of wealth divides rather than unites a people; but suffering shared in common binds it together with hoops of steel. 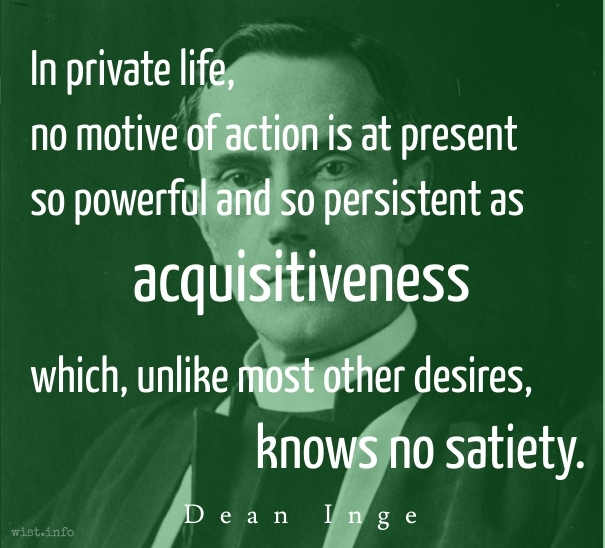 In private life, no motive of action is at present so powerful and so persistent as acquisitiveness, which, unlike most other desires, knows no satiety. Worry is the interest paid on trouble before it falls due. We must cut our coat according to our cloth, and adapt ourselves to changing circumstances. Personalize your sympathies; depersonalize you antipathies. The proper time to influence the character of a child is about a hundred years before he is born.